This is Part 2 in our series: Facebook Ads Bidding Demystified. Check out Part 1 here. In this post we’ll be covering budget and bid types. 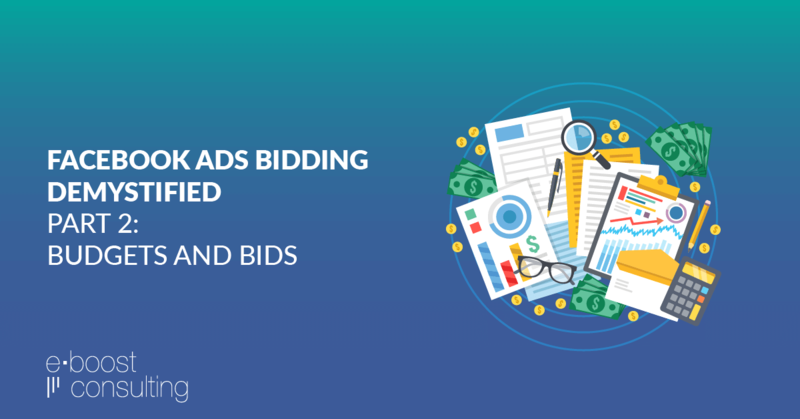 While they may sound self-explanatory and straight forward, your budget and bid selections can have huge impacts on ad performance. You may need to increase your bid. Not getting the results you wanted? You may need to change the optimization type on your bid. Let’s dive into the options you’ll be presented with when setting up your ads and what we recommend choosing. Your budget is the amount that you’re willing to spend on your ads. You can choose either a daily budget or a lifetime budget and it’s important to note that the budget is not necessarily what you will spend, but the maximum that you’ll spend. Another important note is that your budgets are set at the Ad Set level, not the Campaign level. So each ad set has its own budget and if you duplicate an ad set, you’re doubling your budget. Daily Budgets – set a fixed amount you want to spend per day. We use these for most campaigns because they are the most flexible and easiest to scale. Note that this is your average daily budget and Facebook will spend up to 25% above your daily budget on any given day depending on performance. Facebook will average those swings over each calendar week, however, to keep your set daily budget as the overall weekly average. When using day-parted campaigns. If you want to run your ads only certain days of the week or certain times of day, Facebook has a tough time delivering consistently with daily budgets so we always use lifetime budgets in those scenarios. When you have a very specific budget to spend for a campaign – if a client wants to spend $1,000 for a promotion and we know the promo run dates, we’ll often use a lifetime budget in order to ensure the delivery is accurate and we spend the appropriate budget in the appropriate time-frame. The Optimization selection tells Facebook how to deliver your ads. For example, people who comment on and share ads are different from people who purchase products. Facebook knows who does what and by telling them what your goals are, they can tailor the delivery toward people more likely to help you achieve your goals. After you select your objective (covered in Part 1), you will select your optimization type. Certain types are only available for certain objectives. Explanation: Facebook will deliver your ads to people who are likely to complete an action in your app that you specify. Notes/Tips: These work well and if you set them up properly you can deliver higher quality app users vs using the App Installs campaign optimization. Note that you need to have the App SDK set up and be passing events to Facebook. Explanation: Facebook will deliver your ads with the objective of getting the most app installs at the lowest cost. Notes/Tips: These work great for getting installs on your app, but watch the engagement of the users you’re acquiring. If they aren’t using the app after installing it, consider using the App Events optimization strategy. Explanation: Facebook will deliver your ads to people most likely to complete an action on your website. Notes/Tips: This is the optimization strategy we use most often. It allows you to optimize for Ecommerce actions such as a purchase or Lead Generation actions such as a download or signup on your website. Notes/Tips: We don’t use this much as it tends to not drive actions as well as other optimization strategies like landing page views or conversions. Explanation: Facebook will deliver your ads to people most likely to RSVP to your event on Facebook. Notes/Tips: These work great, we use them to drive RSVPs for local events and they are great for building buzz and social credibility. Explanation: Facebook delivers your ads to people as many times as possible. Notes/Tips: We don’t use this much as Facebook will deliver your ads to the cheapest users out there. This traffic tends to not take action or drive business goals as well as other objectives like landing page views or conversions. Explanation: Facebook will deliver your ads to people who are likely to click the link to your website and stick around at least until the landing page loads. Notes/Tips: This is a relatively new optimization strategy from Facebook and one that we’ve been using quite a bit lately. It’s likely in response to the low quality of traffic from the Link Clicks optimization strategy. Explanation: Facebook will optimize your delivery toward people who are most likely to complete your lead form on Facebook. Notes/Tips: Lead Ads work very well on Facebook and this is the only optimization strategy available for this ad type. Explanation: Facebook will deliver your ads to people who are most likely to click the links in your ads. This includes links in your ads that direct traffic to a destination on or off Facebook. Notes/Tips: We don’t use this objective much anymore as we’ve found it drives cheap, but low-quality traffic. We often find CPCs of well under $0.05 with this traffic but we see very low conversion rates. Notes/Tips: This optimization strategy works very well driving new Likes on your page, but make sure you have a plan in place to utilize those likes. People often complain that fans driven from Page Like ads are less engaged and can actually hurt your organic reach. Explanation: Facebook will deliver your ads to people most likely to engage with them. Engagement consists of Likes, Reactions, Shares, or Comments on your ads. Notes/Tips: This optimization strategy works very well for getting engagement on your ads and can be a good way to boost social credibility before optimizing an ad for conversions. Explanation: You can deliver your ads in such a way to reach the largest number of people in your selected audience. Notes/Tips: This is the only Facebook ad type where you can define a frequency cap. So if you want to deliver no more than 2 impressions per person every 14 days, you can select that. Explanation: Facebook delivers your ads to people who are likely to have a conversation with you through Facebook Messenger. Notes/Tips: This is the only optimization strategy available for Messenger Ads. Explanation: Facebook delivers your ads to people who are likely to visit your physical business locations. Notes/Tips: This is theoretically great for driving foot traffic into your physical store locations, but we haven’t seen it work very well in practice and typically see very high costs per conversion with this optimization strategy. Explanation: Facebook will deliver your ads to people who are likely to view at least 10 seconds of your videos. Notes/Tips: We typically don’t recommend using this unless you are purely looking for views of your video. The engagement tends to be low with this optimization strategy. Explanation: Facebook will get you the lowest cost results based on your optimization strategy and and will bid more as needed in order to spend your budget. Notes/Tips: This is a good place to start because you are essentially guaranteed delivery, but note that your costs will rise as you increase your budget. Oftentimes we’ll start with a lowest cost bid and then switch to a Target Cost bid once the campaign CPAs have stabilized. If spending your full budget is a priority, choose this bid. If maintaining a stable CPA is your priority, choose the Lowest Cost with a Bid Cap or the Target Cost bid option. Explanation: Similar to the Lowest Cost bid option, but you can manually select the maximum amount you’re willing to pay for any individual result. Notes/Tips: We rarely use this bid type as it tends to be a bit too restrictive for Facebook to be able to optimize delivery adequately. Explanation: With a target cost bid, you tell Facebook what a conversion is worth to you and they try to deliver your ads to meet that goal. Notes/Tips: This bid type works well for maintaining a stable cost per conversion while scaling spend up. If Facebook doesn’t think it can meet your target cost per conversion, however, they will not deliver your ads. So if you are not getting delivery we recommend either increasing your target cost bid or changing to a lowest cost bid. Also note that we usually bid 2-3x our actual target cost in order to ensure delivery. The actual cost per conversion tends to come in far below the bid amount. Explanation: You pay per 1,000 ad impressions, regardless of the results. Notes/Tips: This is the only option for most campaign types and we rarely select anything else. Explanation: You only pay when someone clicks on your ads. Notes/Tips: Use this option if a click is only worth a very specific amount to you, but note that it can be tough to get delivery. Facebook only gets paid when someone clicks on your ads so it’s a bit riskier for them to run your ad when paying on a CPC vs on Impression. Make sure your ad creative and audience targeting is dialed in so that you’ll have high CTRs if you use this! Notes/Tips: This can be a good tactic to use when testing multiple video creatives – you pay only when someone views at least 10 seconds of your video so you can test quite a bit with a relatively low budget. Don’t make large budget changes often! Facebook’s ad delivery system ‘learns’ how to deliver your ads over time based on your optimization strategy. When you make a large budget change (either increasing or decreasing budget by a large percentage at once), the system needs to restart the learning process and you will likely see a temporary (sometimes even permanent) dip in performance. Stick to budget changes of 10% – 20% at a time. Lowest cost vs Target cost: If your goal is to scale while keeping cost per result steady, use a target cost bid. If your goal is to spend the full budget and you’re less concerned about cost per conversion rising, use a lowest cost bid. Bid 2-3x your actual target when using a target cost bid. If you bid at your actual goal cost-per-conversion and the ads don’t perform well from the start, Facebook will gradually stop delivery and your ads will fizzle out. Bidding 2-3x your actual target doesn’t mean you’ll pay that, it just gives Facebook the freedom to test and optimize delivery until it finds the sweet spot that converts. Optimize for Actions. There are quite a few optimization strategies that revolve around what we call ‘vanity metrics’ – reach, brand awareness, impressions, etc. While these certainly have value, you can drive those impressions while also achieving more important business results like actions or sales by using one of the more action-oriented optimization strategies. Bidding is a crucial part of a winning Facebook Ads strategy. The objectives and bid types you choose can set you off on the right foot to success of derail you from the start. Using the tips in this article (and Part 1) will get you well on your way to creating a successful Facebook Ads campaign. Does all this sound too time consuming or complicated? Looking for someone to take all of this off your hands and get it done right? Contact Us today for a free consultation and marketing proposal.